This is *basically* what my friend saw. 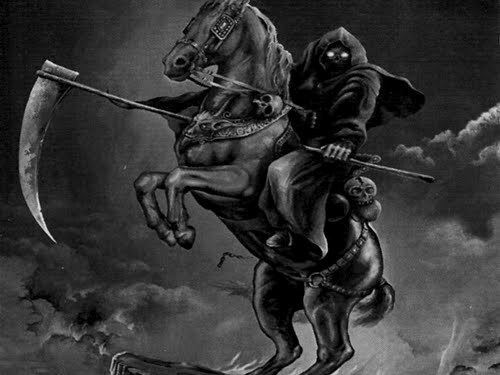 From a friend out on a ride I heard a tale of an individual dressed in full grim reaper garb, including sickle, and mounted on a black steed, stationed at one end of the bridge over the river from William Pond to Goethe Park River Bend Park. Just from one report I am willing to dub this individual the wearer of the greatest costume ever seen in Sacramento. Did anyone else see this? UPDATE: RonTopOfIt came through. That bridge is called the Harold Richey Memorial Bicycle Bridge. Wasn’t a costume. Tell your friend to finish his will.